I shall show you how to draw the correct expressions on the faces of cartoon characters. You can sometimes sense the mood of fellow humans by their facial features. There are scores of moods reflected in many different emotions such as happiness, sadness, worry, shyness, cunningness, anger, joy and surprise. A cartoonist exaggerates what is seen so that a reader instantly knows what the cartoon character feels. I shall first show you how to draw happy faces. The mouth line clearly shows when someone is in a happy mood when it curves upwards. The eyebrows may stay still; more often they arch or tighten up slightly. Have a look at Fig. 1. Notice how a smile can be extended into great mirth or joy. You will notice that the eyes can help to determine the mood. They seem to become round, or narrow, or may even close. There can be tears of joy flying as well. Fig. 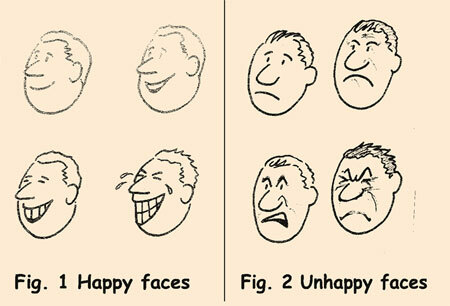 2 illustrates a gloomy facial expression, the opposite of a happy one. The mouth lines go down while the eyebrows either remain up, stay fairly straight or turn down towards the nose. Anger or fury are expressions of gloom. Drawing and painting expressions is the hardest part of creating cartoons. Scribble down few sketches of oval shapes to use as cartoon heads. Begin with a frontal face. Fig. 4 and 5 which shows different faces in profile. Begin by drawing a big nose for fictional man and small one for a lady. Observe how each feature is illustrated. Fig. 6 shows frontal cartoon faces. Now you have basic face shapes from which to work on or to develop. Fig. 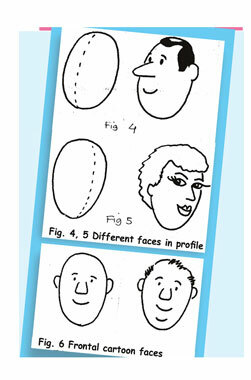 6 will show you the basic outlines of cartoon faces. 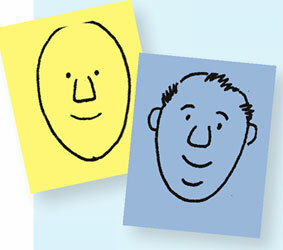 You can practise oval shaped outline sketches to develop a facial expression.